This article helped me a great deal in programming this little application I’m building with C#. It was written by Ali Badereddin. There are two very common ways of telling the user that your application is busy. One is to show a progress bar that gets updated based on the progress getting done, and another is to show the “Waiting” cursor while the application is doing work. To show the user the Waiting cursor while your program is busy, all you have to do is to set the current cursor to the Waiting cursor before your code runs, then set it back to an arrow after your code completes. So instead of putting your code in the event handler method, you will replace it with a call to start the worker process then move the code to the worker process events. The worker process will do its work in the DoWork event. 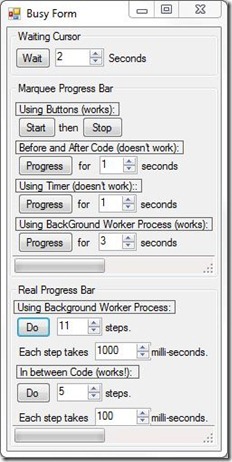 To show progress, the code needs to be split into segments and the background worker ReportProgress method needs to be called whenever a segment of code is executed. Whenever progress changes, we need to update the value of the progress bar. When the worker process is done (progress = 100%), we reset the progress bar. Below is a Windows Form application that lets you try the concepts explained above, and also shows you how the Marquee progress bar works, which is shockingly harder than the more realistic single-threaded progress bar we’ve discussed above. Download source and exe from here. This entry was posted on Wednesday, June 2nd, 2010 at 8:34 pm and is filed under C# (C-Sharp). You can follow any responses to this entry through the RSS 2.0 feed. You can leave a response, or trackback from your own site.